87. You know I hate to ask, but are friends electric? 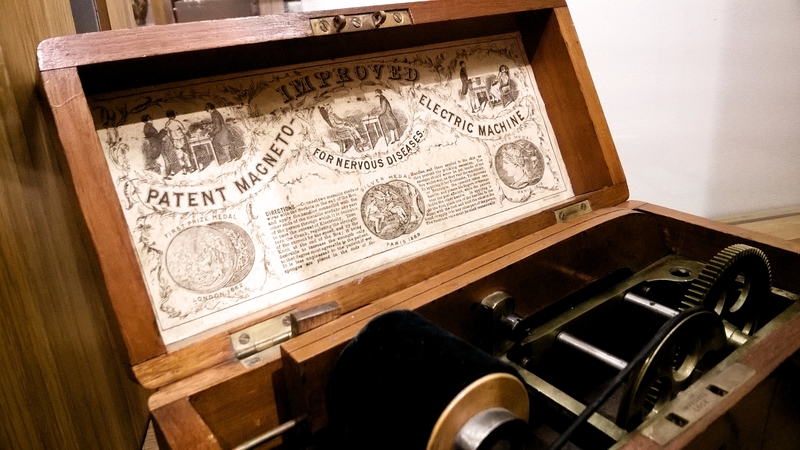 A patent magneto electric machine. USB C adaptor is $40 extra. In August, I took an Australian visitor to Lincoln Castle for a good slice of History. Everywhere there were flamboyant characters in Victorian outfits and I soon realised Lincoln was hosting a steampunk festival and we were getting more History than just the Magna Carta. Officially called The Asylum Festival, the event centred on The Lawn hospital, near Lincoln Castle, an early nineteenth century building which, until 1985, served as a mental hospital. In this case, and in general, it’s easy to argue that steampunk is filling not just a building but also a cultural void at the Lawn vacated by psychiatry, at least in terms of celebrating the Gothic. According to wikipedia, Steampunk refers to a subgenre of science fiction and sometimes fantasy that incorporates technology and aesthetic designs inspired by 19th-century steam-powered machinery. Contrast with Psychiatry, which refers to a subgenre of medicine and sometimes fantasy that incorporates technology and aesthetic designs inspired by 19th century electrical-powered machinery. Another attempted definition of Steampunk is ‘modern technology—iPads, computers, robotics, air travel—powered by steam and set in the 1800’s’. Again, contrast with psychiatry, which is all about old ideas (mental energy, chemical deficiencies, mindfulness etc) set in a concrete building on a business park modelled on George Smiley’s HQ. The point is, Steampunk celebrates the art of anachronism, whereas psychiatry regards it with a mixture of hatred and denial. The Lawn was opened in 1819, which was before the reign of Queen Victoria, but most of the British Asylum hospitals were built during the Victorian period. Many of them were gothic in style, making them a suitable venue for wearing top hats and tinted goggles, riding round on penny farthings and racing steam robots. Nowadays, psychiatry is shy about its Victorian heritage. The contribution of Freud and his colleagues is celebrated only in terms of a sprinkling of multiple choice questions. Freud’s early work would now be called Neuroscience and we know that he was intrigued by nerve tissue and would have taken a much more Electric road, if only he’d had access to multipacks of AAA batteries or a USB charger. Freud knew that the brain was electrically powered – indeed this discovery went back to the end of the eighteenth century. He attributed symptoms like hysterical paralysis to mental energy short-circuiting down the wrong pathways. Since the Victorian era of psychiatric treatment, electricity popped up as a treatment option at frequent intervals. Nowadays there are many people working on various kinds of electrical brain stimulation, such as deep brain stimulation, transcranial direct current brain stimulation (tDCS), magnetic stimulation and the original and genuine product, ECT. This is not, you understand, the official penchant of British psychiatry, which by convention pretends to emphasise social and psychological approaches. You’re supposed to listen actively for at least five minutes before getting the talk round to tablets and quite a bit longer before mentioning the E word. That’s just a convention. I wouldn’t call it hypocritical, more, let’s say ‘dual mode’. People say they want to be listened to more than anything else, but that stance also can be a little dual-modish. Quite a number of patients are in search of physical treatments of one kind or another and want to seek medical advice before buying batteries and sponges from B and Q. Talking yes, counselling certainly, making a few changes to your life, I guess so, but hey, just tossing an idea out there, how about electricity? Sadly, the custodians of ECT, psychiatrists and their colleagues in mental health trusts, have completely failed to market their product at all. The number of people prescribed ECT has declined dramatically over the years. Depending on where you stand on this argument, either it is being enormously under-utilised or you can’t believe it’s still going on at all. Because the NHS mainly seeks to discourage people turning up to use its services, nothing much has been done to promote electrical treatments. The premises used are a bit drab and though they are strictly regulated, the ambience is a bit like the blood – doning centre, being a strange mixture of homeliness and apprehension. After ‘One Flew over the Cuckoo’s Nest’ was made and shown to generations of students, the Royal College decided that ECT could never be made to look cool ever again. Regulators like NICE narrowed down the number of indications and the treatment itself changed a lot subsequent to most of the controlled trials that were conducted. A different anesthetic is used, the energy level has been reduced, the ECT box is not made of mahogany any more and some units don’t even provide free toast after treatment. Arguably, the toast issue has been the most damaging.Whereas 6 to 8 treatments used to be standard in the toast era, now it’s often 12. I doubt if ECT will be hived off to the private sector, but it wouldn’t totally surprise me to see new departments of electro-therapy in different settings, like sports medicine clinics or the corner of Debenhams. Unlike ECT, tDCS has acquired a better vibe, being used by the Air Force to keep people concentrating and allegedly by students to improve their performance in games and exams. Perhaps more psychiatrists should be looking at it, but they won’t hurry because they are still struggling with their electrical baggage. Steampunks would be delighted with a treatment like tDCS that was invented in 1798, but psychiatrists haven’t yet learned to love and embrace the anachronisms of modern life.